Booklet, 5” x 6”, “Some Difficulties proposed For Solution or a Copy of a Letter to the Rev. 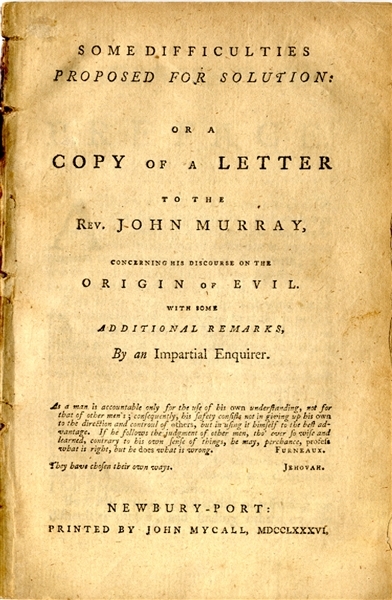 John Murray, Concerning his Discourse on the Origin of Evil...”,Newbury-Port, john Mycall, 1786, disbound, 60pp., VG. The booklet is Worcester's argument in his doctrinal dispute with Reverend Murray, the founder of Universalism. FIRST EDITION. Evans 20158.